Week 35: Comic Art and Mixed Media Mayhem. This week the 2Create group continued working towards the Comic Art Festival window display for the Game shop windows in Kendal. They started planning out how they were goinf to construct the models of some of Kendals more notable buildings before adding a comic twist. Some were also designing their characters to sit alongside the official Comic Art festival characters. The Kentmere Ward group had a choice to decorate plant pots or draw blackberries. The plant pots were decorated with images from magazines and torn paper. Some people drew the blackberries while others made cards and decorated using tissue paper. And of course the blackberries were eaten! In a busy session a variety of activities took place with every participant working on individual pieces: drawing, knitting, comic art, coil pots, sewing, needle felting, lino cutting and model making. One participant had been working on em…broidery for months and they brought in the finished item, mounted and framed, to show the group. A brilliant example of her skill and patience! It is important to be able to support individuals in creating work that is meaningful to them. The group had a break from Comic Art Fest and started work on a group piece for the new gallery. We are creating a set of mixed media pieces that will be stitched together in one giant work to display in the new gallery. Some also did their own thing, finishing a Barbara Hepworth inspired sculpture and working on heraldry. Week 34: In which we are creative and do stuff for other people too! This week has seen us start getting going in earnest ready for the Comic Art Festival in October. The window displays we are doing are going to need to be ready by the beginning of October and with the move to our new building around then too things could get tight! We have sorted out the plans but still need to get it all made. We also got involved this week in a C-Art project, making Mayfly for an exhibition in Rheged for the C-Art event in September. This was a good session as relating the Mayfly to a thing each maker cherished proved very rewarding. A reminder too that we stop regular sessions on September 15th while we sort out the move to the new unit (though there may be a few emergency Comic Art Fest make sessions). 2Create today continued working towards the Comic Art Festival window display for the trail. Some started enlarging their characters while we finalised the overall appearance of the window and drew up a to do list. It is getting close! In the session today on the ward, we decided to doodle! We let our pens form shapes on the paper, and then we filled each individual area with a different pattern. This gradually built up to fill each square and create the most eye-catching…, pleasing designs. This technique is very therapeutic and restful to do, allowing participants the freedom to talk and create, or just lose themselves in the images. We folded the paper to form a small card, which made for a very achievable activity. Individuals then chose to either colour their images, or to leave them black and white. A very productive session. In a slightly quieter, but nonetheless productive session today, individuals worked on different projects: cartoons, coil pots, friendship bracelets, needlework, papier-mache and lino cutting. The atmosphere was supportive, inspiring and therapeutic. This week the DeafArt group had a go at a few things including paper cuts and drawing the new Doctor Who. Please note, there will be no DeafArt session on 29th August but will return the following week. Today we were working on two projects for other people! Firstly we were making Mayfly images from card. This was for the C-Art events in September and in particular an exhibition at Rheged. Loads of these Mayfly models will be put together each with words on the theme of something the maker cherishes. A few also started on Space Invader pics for the Comic Art Festival. Plans are now in place for Space2Create to move into their new home. It is hoped this will be from October 1st and we will have a break from running sessions from 15th September aiming to restart in our new premises on 6th October. Watch this space for more details and information as we get closer! There is a definite summer holiday feel around at the moment with many Space2Create members off to holiday in sunnier climates or helping look after grandchildren, children and visiting relatives. There has still been a lot of very creative work and we start to look forward to the Comic Art festival in October where we are doing window displays for the Comic Art Trail. After being inspired by a programme called “The Art of China”, the 2Create group looked at Chinese writing. They looked at some of the symbols used where Chinese writing is in the form of pictures each with it’s own meaning and how these ha…d developed over the years. The group then had a go at designing their own to describe themselves. It turned into a fun and enjoyable (and revealing) session. Some were fun but some let out some really serious thoughts in the form of their pictograms. Running through the session was a remembrance of Robin Williams and his brilliance which ended so tragically. On the ward the group created images using sections of torn up magazines to create a collage. They focused on selecting colours rather than whole images to build a new image. In a very busy session today, individuals worked on a variety of projects: from the friendship bracelets started last week to collage making, knitting, sewing, rag rugging and puppet making. Thursdays are always inspirational and unique. It was also lovely to welcome a new participant. Another great session with everyone doing their own thing this week. In WellArt today we did some more designing ahead of the Comic Art Festival. The overall plan is in place we are now starting to get the bits together for the Kendal Game window as part of the Comic Arts Trail through the town. WellArt group members started working on characters to represent themselves in the window. Some heraldry going on too with a bit of watercolours on the side! A quite week this week with many away on holiday or with children to mind. Still did not stop a great deal of creative work being produced in the sessions. 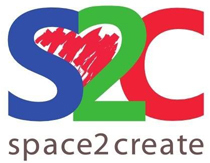 Out of the creative spotlight behind the scenes we are working towards achieving a new space for S2C with a gallery and studios to run our sessions. Funding is well under way and we are talking with the developer about a location so watch this space for announcements maybe round end of September. A quiet session today but lots of creative ideas. We continued our collage theme from last week. Some were finishing off images but some started new ones but with a little more surreal forms taking pics from mags and assembling interesting compositions. Some drawing in pen too. The Thursday Group set about their usual creative splurge with lots going on. Each person with different projects and ideas. The rag rugger is working on an amzing sheep and some were weaving bright colourful bands. Another member was preparing work for the upcoming Comic Arts Festival. In the DeafArt session the group were getting creative with pencil shavings. They used what is normally thrown away to create some imaginative pieces. good recycling! The group continued their Barbara Hepworth inspiration. Some carried on with the soap carving as well as creating instant Barbara Hepworth Sculptures! This uses meat trays or take away cartons and plastecine to create shapes. Some also set …wire into the plastecine. The plaster was mixed and poured in. It only takes around twenty minutes to harden and then the artists were able to start carving and modifying their sculptures. These could then be set in plinths of plaster afterwards. These are ready to carry on with next time. Week 31: Collage, cool stuff and Hepworth inspiration. I have to say that running groups for S2C sometimes has perks. I know it was only soap carving but carving and sculpting of any kind in the middle of a Barbara Hepworth exhibition is pretty inspiring and with photos of the lady herself staring down at you, gave a shiver down the spine. Also this week we can say that funding has no been found so we are soon going to be making exciting announcements about our move into a new venue! Watch this space. The group had a go at collage. We were keen to create pictures from images ripped up but just focusing on the colours of the paper not the pictures on them. By careful selection of images and the ripped pieces from them some really creative pictures started to emerge. It may take another session to finish them off. On the ward, the group experimented with a kind of collage/decoupage, in which paper covered with a conventional washed acrylic background was in turn highlighted with objects cut from a vastly differing colour scheme, and set out from the paper in a 3D effect. The resulting images consequently took on a fairly surreal aspect, in what proved a highly enjoyable and productive session. We were shown how to make friendship bracelets by one of the participants. One of our regular participants is in hospital at the moment, so one of her friends decided to make one of these lovely friendship bracelets as a… gift. As always on Thursdays, there were lots of other individual works being created: from rug making and hooking to doll making, sketching, sewing and puppet making. A productive morning, will many new skills being taught and learnt. A real mixed bag of creativity at DeafArt this week. The group tried a number of different things to create some great images. The WellArt group was unable to use the LAB today so we had a very unique experience. We found ourselves soap carving in the middle of the Barbara Hepworth exhibition which was great fun and very inspiring. Sat among photos of the artist felt like being observed as we carved. Some great little pieces of work were done and a great session for those that came today.